Neat idea – take the composer of some of the finest pop songs of the 1960s and get him to re-record them paired up with a bunch of admirers. It did take a few listens before I warmed to this collection, which came out on Universal in 2010, because I kept thinking “how can this add something to the original?”. But after a while I found myself enjoying it – or at least most of it. The opening track (‘Better Days’) with Bruce Springsteen sounds as if it could have been written by the Boss himself! 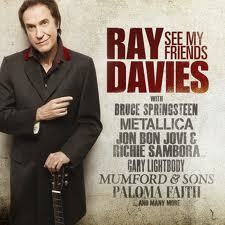 The mash-up of ‘Days’ and ‘This Time Tomorrow’ with Mumford and Sons work really well as does ‘Lola’ with Paloma Faith. Sadly ‘Waterloo Sunset’ with Jackson Browne doesn’t work so well and ‘All Day and All Of The Night’ isn’t a patch on the original Kinks version. One of the reasons I buy CDs more than download is because I am an obsessive reader of sleeve notes/booklets. Knowing who plays what on each track can really enhance listening as you can see if you can detect the differences between drummers or bassists or whatever. Similarly, good – or witty – notes also help and a nice part of this package are the paragraphs by Ray Davies on ‘Then’ and ‘Now’ reflecting on the origins of the song and its first recording and on the new collaboration.